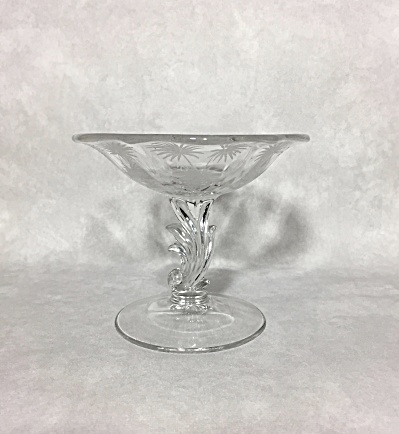 From 1937-1954 the Fostoria Glass Company used this cutting known as Lido to add decoration to items in their Baroque (shape) Line. This is a footed comport but would be probably also considered as footed candy dish. The cutting looks like fronds of a palm tree or exploding fireworks. It stands a little over 5 inches tall. An American Art Deco shape and decoration. This is a sweet little gem! How about using it on Valentine's Day to present "a little something". Many a bride in the that time period received the Baroque pattern as a wedding gift. It is a huge line with a huge variety of shapes available. It is in excellent condition.